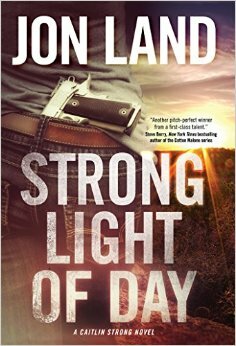 Strong Light of Day, the new Caitlin Strong thriller by Jon Land, is a suspenseful, fast-paced tale apparently constructed by a writer so obsessed with James Bond movies, Stephen King novels, Clint Eastwood westerns, Marvel Comics and The Matrix that he tried to combine all of them into a single book. Logic suggests there’s no way this should work, but somehow it does, making the novel at once preposterous and wildly entertaining. Check out my full Associated Press review here. This entry was posted in Uncategorized and tagged Bruce DeSilva, Caitlin Strong, clint eastwood, james bond, Jon Land, marvel comix, Stephen King, Strong Light of Day, suspense, the matrix, thriller, westerns. Bookmark the permalink.